This was such a big event in the 2010 Congressional campaign for Brian Kelly that we repeat it here. We are looking for the endorsement again for the Senate in 2012. TEA parties can pick DEmocrats when they are convinced they are conservative. Wilkes-Barre, PA – May 7, 2010 -- 11th Congressional District candidate Brian Kelly received the endorsement of the Independence Hall Tea Party PAC. Kelly was on hand to receive the endorsement. When he spoke to the crowd, Kelly was interrupted three times for applause. Kelly is the only Democrat in the three state area (Pennsylvania, New Jersey, and Delaware) in which the Independence Hall Tea Party Operates, to receive this prestigious endorsement. The endorsement was announced Sunday April 11, 2010, in Philadelphia. "We think our endorsed candidates can win in November... and if they do win, you can be sure Nancy Pelosi will no longer be Speaker of the House," said PAC Vice President for New Jersey Bill Green. "Our board, comprised of members from the tri-state region, carefully and thoughtfully considered the candidates and, in almost every instance, reached a unanimous decision. The candidates were judged individually on their platform, credibility, and viability. "One of the candidates, Brian Kelly, is a conservative running in the Democratic primary against Congressman Paul Kanjorski (PA-11)." "We recognize Brian Kelly is an underdog but his conservative platform matches our own and we wish to have an impact on both political parties," said Mr. Green. "So we unanimously voted to endorse him." The Independence Hall Tea Party PAC was formed in February to assist federal candidates in the tri-state region (Pennsylvania, New Jersey, and Delaware) who share the organization's commitment to limited government, fiscal responsibility, and lower taxes. "I am ready for the challenge. I am fed up with the bloated, unresponsive bureaucracy in Washington. I am a Democrat in the style of old Democrats. I have disdain for the socialist hard left of my party. My mission is to bring government back to the people. It is not to take the hard work of the people of Northeastern Pennsylvania and give their earnings to someone who has not worked for it. Yes, I am for helpless people, but I am not for making people helpless... Thank you. I am proud to accept this most appreciated, prestigious endorsement from the Tea party at Independence Hall, the Birthplace of our Nation." Kelly told the crowd. 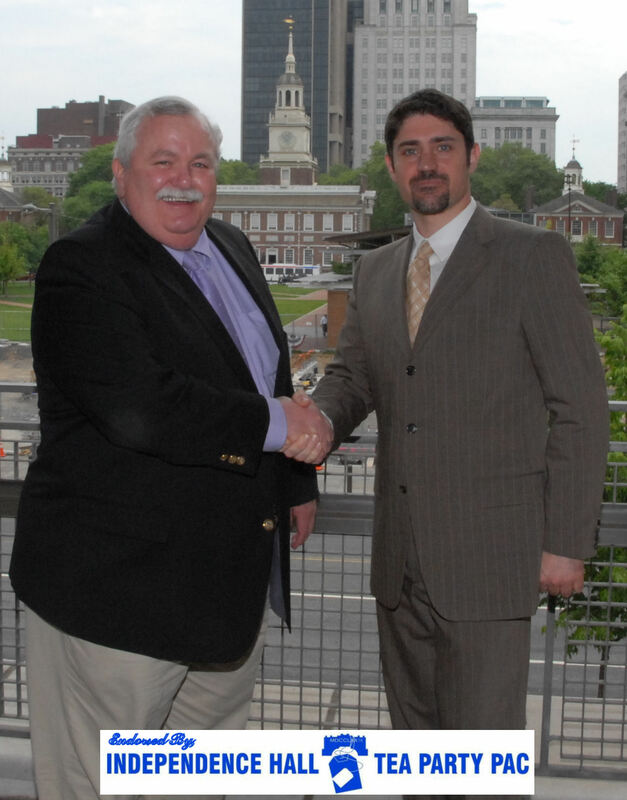 PA endorsed candidate photos were taken with Independence Hall Tea Party PAC Vice President for PA, Sean Carpenter.